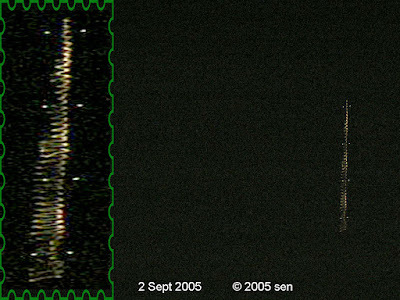 Of my remarkable, colorful and odd looking UFO pictures, most are captured from invisible objects. It doesn't matter how bright or how big they are shown in the photos. Only 20 pictures were seen with my eye. Some objects were even 1 to 3 meters from where I stood. I just couldn't see their fingers or hear any noisy. Only once, two invisible objects landed on the top of my tent, and then I could see some silver mist, like Moon light, shower from the top. I tried to grab the blur fog with my hand, I got nothing. But one evening of October(?) 2005 I saw a spinning small bell shaped flying saucer come down from the cloud, and stayed 35 meters (?) above my kitchen's roof for a minute then slowly turned to another direction. Also my encounter with various types and large number of space life is different than those described events of UFO history. Their size ranged from sand to egg to basketball, to as big as 60 meters wide. Their shapes were micro- organism, insects, reptiles, Phoenix to Dragon like. Humanoid fingers appeared from a Martian(?) captain, middle-age knight, grasshopper robot, upright big bird to bobble shaped evil heads. All those images are in my photos collection.